Powers/Abilities: Skilled swordsman, boxer, martial artist, and masksman. He can fly a plane and he is knowledgable in the sciences. Perhaps the most unusual ability he has is that he is immune to painful stimuli, having learned nerve control in India. History: (Daring Mystery Comics #7, Mystic Comics #6-10, ga) After his father is murdered by the mob for daring to give evidence against them, timid law student swears to gain revenge. He travels the world preparing himself for the task at hand, learning a variety of useful skills, before returning to America to claim his vengeance. He adopts the identity of the Challenger, confronting criminals and challenging them to duels with their own weapons. (She-Hulk) The Challenger was flung into the future, arriving unaged in the modern era. 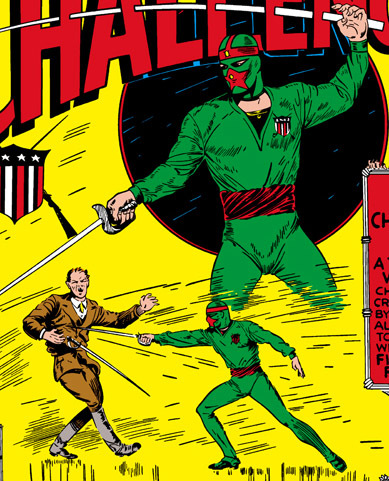 Comments: The Challenger's existence in the modern Marvel Universe was confirmed when he was mentioned in Marvel Premiere #29. Most people seem to believe that the Challenger's true identity was never revealed. However Jeff Nevins states that it was Bill Waring, and I have no reason to doubt him on this.